While the play on words from Greek philosopher Aristotle more than 2,000 years ago was never intended to refer to Kaleb Cowart, it remains a fitting analogy for an Opening Day performance filled with redemption on an evening when fans returned to the bleachers. Coming off a career year in 2012, Cowart struggled at the plate at times when he was promoted to the Texas League last season. But back in the heart of Arkansas' lineup to open 2014, the Angels' top prospect is looking to prove he's ready to take the next step toward the Majors. Cowart went 5-for-6 with a two-run homer, five RBIs and three runs scored as the Travelers rolled to a 20-7 triumph over the Midland RockHounds at Security Bank Ballpark. "Amazing. It was great," Cowart said. "It feels great to do that on Opening Night. Last year, I got off to a bad start and never got out of it. I was doing some things wrong mechanically. My head was moving a lot and I was coming up out of my swing and not hitting the ball the other way." The 21-year-old third baseman stole a base and missed hitting for the cycle by a triple as the Travs thrived under blustery conditions in which winds approached 40 mph. The five hits were a career high, while the five RBIs matched a personal best set for Class A Cedar Rapids on June 1, 2012. After popping out in the first inning, Cowart doubled home Alex Yarbrough in the second and scored on Michael Snyder's single. He beat out an infield hit, stole second and came home again in the fourth, then laced a two-run single as the Travelers sent 13 men to the dish. Cowart walked with two outs in the sixth, launched a two-run homer to right field in the eighth and stroked a single up the middle with two outs in the ninth. "Alex Yarbrough had just hit a single back up the middle and [Ryan Dull] threw me a first-pitch fastball and then a 1-0 changeup that was a good pitch to swing at," Cowart said of his home run. "I put a good swing on it and fortunately it went over the fence. "Hitting is contagious. It's going to be a fun season because the camaraderie with my teammates was great. Man, it was awesome." 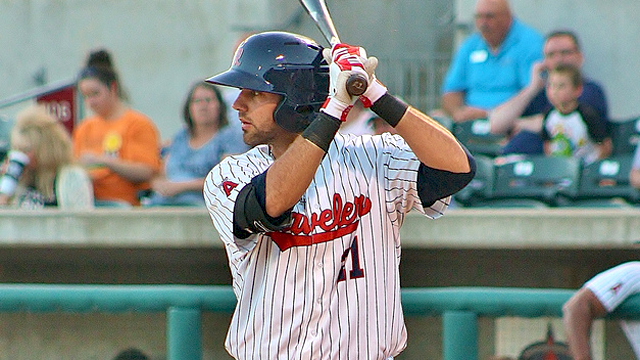 Selected 18th overall in the 2010 Draft out of Cook High School in Georgia, Cowart batted .221 with six homers and 42 RBIs in 132 Texas League games last season. The 6-foot-3 switch-hitter batted just .202 against right-handed pitchers as his mechanics at the plate proved inconsistent, prompting the organization to send him back to Double-A to repeat the Texas League this year. "I knew 100 percent I was going to come back here," Cowart said. "Not too many people move up when you hit like I did." In an effort to improve his consistency, Cowart spent extra time in the gym and in the cage over the winter. He worked out with Brian McCann, Freddie Freeman and Jeff Francoeur in Georgia and added more than 20 pounds of muscle to bulk up to 227 pounds coming into Spring Training. "The first three months of the offseason ... I was able to get away from home and focus on baseball," Cowart said. "I was able to interact with some Major Leaguers and see the way they play the game and go about their business. "I tried to stay on my swing and eliminate my head movement. I was getting too much weight on my back side. I tried to stay inside the ball, not pull everything and get true backspin line drives." On Thursday, right fielder Drew Heid was 4-for-5 with three runs scored and an RBI, first baseman Michael Snyder reached base four times and scored three runs and Yarbrough contributed three hits, three runs scored and two RBIs. Top A's prospect Addison Russell went 3-for-5 with a double, a stolen base and a run scored in his Double-A debut for the RockHounds.